A Life Of Music.Rocks: Daphne and Celeste - Save The World. My relationship with Daphne and Celeste has been well documented over many pub conversations, and in a blog I wrote about 6 years ago - before their recent triumphant return to the music scene. I am so hipster. Around the turn of the century, two girls called Karen and Celeste burst into the public conciousness as Daphne and Celeste, singing very loud bouncy pop songs that absolutely everybody professed to hate. I wasn't a massive fan of the music - 'Ooh, stick you' was fun and catchy but no 'Mmmbop', 'U.G.L.Y' was a bit mean, I thought at the time (although I have recently revised my opinion). I was into Rock, with a very much intended capital R. However, Daphne and Celeste the people - I loved them. They appeared on my radar and demanded my attention. Because they were brave as fook. They did not give a sherbert dip dap for whatever anyone said about them, or indeed how much piss was in the bottles launched at them at the Reading festival. And then they disappeared. If they ever came up in conversation I got stared at in disbelief when I uttered the words ' Proper punk they were', and they very rarely came up in conversation anyway. Until 2015. In 2015 Twitter finally fulfilled its promise, and was the meeting ground for the duo and Max Tundra. Max Tundra said 'Hey Daphne and Celeste, I think we should make a song that will make men with beards who like craft beer really, really happy' and Daphne and Celeste said 'That sounds really, really, really neat.' And so was created 'You and I Alone’. Then they went back to sleep for a while, until the end of last month, when they returned to Save The World. This review starts... now. 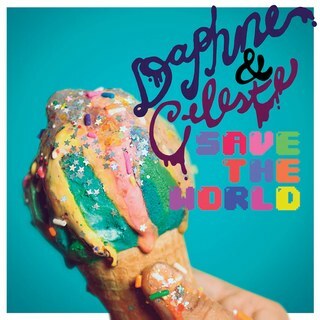 Daphne and Celeste Save the World is the album you always wanted Daphne and Celeste to record without even knowing you wanted Daphne and Celeste to record another thing ever again. It's like if someone got a big bag of your favourite sweets, found a way to take the sweets and turn them into musical notes, gave them to your favourite TV presenter from your childhood who then introduced your best friend who had learned to play a synthesizer especially for your birthday, who then proceeded to play all these tunes as they formed big images in front of you of your best memories ever, but in 8-bit computer graphics. ‘Sunny Day’ reminds me of ‘Dear Jessie’ by Madonna, without being anything like it. ‘Dear Jessie’ is the best Madonna song post 1986. ‘BB’ is so unbelievably catchy I still find myself singing the chorus without realising I’m doing it, at least a month after I first heard it. ‘You and I alone’ ' is great and always makes me smile happily into my craft beer while stroking my luxuriant beard. ‘Whatever happened to Yazz?’ is a song I can imagine listening to with The Human League, as we chuckle away and go ‘Whatever did happen to Yazz?’ I would then have to admit that I do know what happened to Yazz, as that’s the kind of thing I spend too much time thinking about and I’ve googled it before. It’s an album that made someone like me who isn’t a reviewer want to do a review, so I could tell people to listen to it. Listen to it. Or it's on spotify. Or itunes. Or all those other things you can't stroke.